“But I thought Apple computers never break!”. Nope, all good things must come to an end (I probably heard this in an episode of the Netflix’s Series of Unfortunate Events). Yes, even Mac logic boards, or motherboards die out. I wonder why they call them motherboards, why not fatherboards or daddyboards? Okay I digress. The point is, you have a 13” Macbook Pro and in some ritual of trial and error, you’ve decided that the problem is the logic board. But wait, have you tried turning the computer on and off? Just kidding! By now, you are realizing that the heading of this section was on point. So this is not like your typical how to guide. First off, please DO NOT use this unhelpful guide to replace your Apple Logic Board. Seriously, it’s not very helpful, although it’s kind of fun to read, at least that’s my opinion. It does have some good info, but I would highly recommend looking at other articles, or even moving pictures, AKA a Youtube video, before replacing your logic board. This is a kind of a parody “how to” with some actual good information. We are not responsible if you break/fry/blow up your computer or computer parts because of this guide, continue at your own risk! Use a very small Philips screw driver to remove the 10 screws on the back panel. How small of a screwdriver? I don’t know, just try different ones until one unscrews. By the way the screws are different sizes, so keep in mind which ones go where. 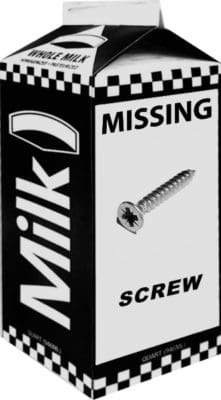 I don’t have to tell you not lose the screws, but I will anyway, DON’T LOSE THE DAMN SCREWS! But if you do, just send us an email, we have those, you know since we’re an Apple computer part store and all. 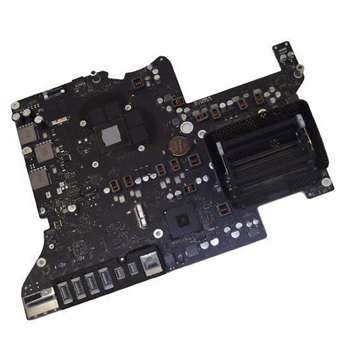 Basically disconnect anything that is connected to the logic board. “Oh geez, which one is the logic board?” something a reader of this article may ask. It’s the big computer chip looking thing that everything connects to. Okay fine, I’ll stop being a jerk (for now). Don’t be cheap and/or lazy, use a spudger to do the following steps (or don’t, so you can buy more parts from us and we’ll get rich, muhahahaha). First remove the battery connector, which is located by, get this, the battery! It pops up, if you are smart enough to use the spudger to get underneath it. Then remove the battery indicator connecter, which is next to the battery connecter, what a surprise. On the other side of the memory card, there are two ribbon cables, one is tiny the other is a bit bigger. They are both fragile, so be very, very careful before doing the next step. There is a tape on the small ribbon, take it off. Now you’ll have to pry up a tab before you can remove the tiny ribbon cable. Do the same for the other ribbon cable. If at this point you have removed the ribbon cables, you messed up! I didn’t say remove yet, just pry up the tab. Once both tabs are pried up, gently pull out the ribbon cables by pulling them away (not upward) from the connector. The rest of the cables just pop up (like the battery cable) if you get the spudger under them. Remember, this is not a helpful guide, so we’re not going to be very helpful by going through each cable. There is one cable close to the fan, it’s the cable that connects to your webcam and LCD monitor. Be very gentile with this cable and don’t try to pop it up instead pull it out away from the connector. The speaker cable is also next to the fan, but it does pop up, but first try to nudge out each corner before popping it open. The CPU fan plug is the same way. Finally, the LCD display cable (located on the corner opposite of the fan) is a bit complicated and if we were helpful, we would have a photo here but we’re not. So, yeah just do your best, we believe in you! This is a no-brainer I don’t even know why we made a separate sub-heading for this one. Just take out the three screws and, guess what, DON’T LOSE THEM! The screws may not be Philips, you may need a T6 Star Shaped Screwdriver. This is also straight forward for a smart reader like yourself! This is the only time I will be helpful, I promise it’s the last time. The screws may be different sizes depending on where they are, so come up with a system of some sort and remember where they went. You can do a drawing or take a picture of the screws, then print it, then place the screws on top of the photo. When all the screws are out, lift up the right side (where the fan was) of the motherboard first at an angle, then wiggle it so you get the connectors loose then finally pull out the old motherboard. You may need to use the same screwdriver that you used for the fan screws. Oh and by the way there are 7 screws. Now give yourself a pat on your back. Clap for yourself. Do a celebratory dance. 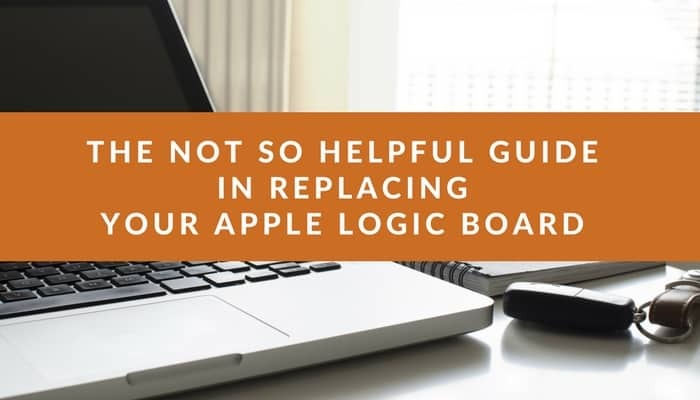 You managed to replace an Mac Logic Board, no thanks to this guide. Seriously, if you truly followed this guide and successfully replaced your computer’s logic board, you are either very lucky or the title of this article needs to be changed, to something like “The sometimes helpful guide…”. But if you were not able to replace your logic board and are super pissed at me, I am not sorry, because I did warn you. 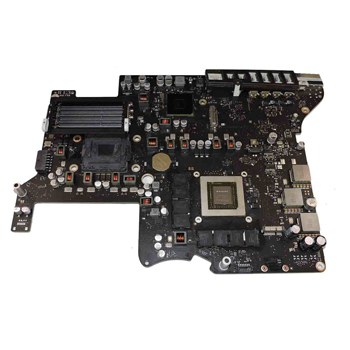 What we can offer you is replacement logic boards, for a price of course, yay! Also, if you need help fixing your apple computers, believe or not, we are in the business of fixing computers. So give us a call or come by our shop in Tujunga, CA. I hope you enjoyed this as much as I did. 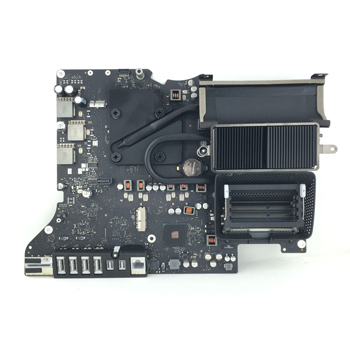 This entry was posted in Blog and tagged apple, logic board, mac, motherboard.